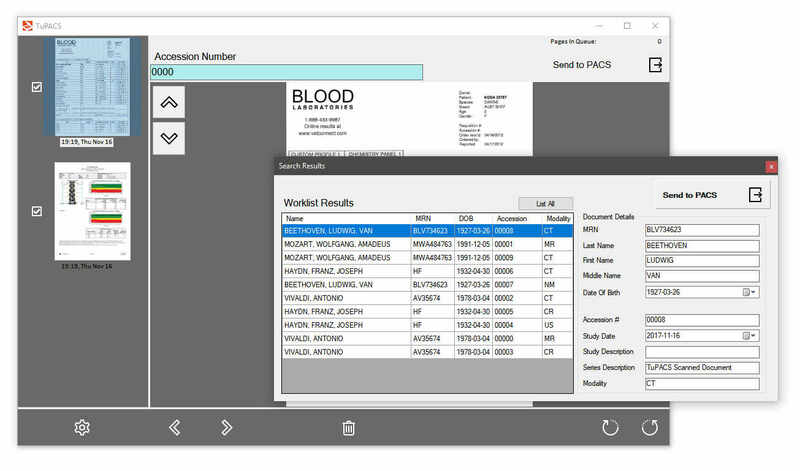 TuPACS gets things from your document scanner, lets you search DICOM modality worklist, and sends directly to PACS. TuPACS is our simple Scan to PACS tool. It’s been designed to make this one task as easy as it can possibly be. Document scanning integration with most scanner brands using WIA. Re-order and rotate pages before sending to PACS. Can match worklist using Patient ID, Accession, or Patient Name. Stores to PACS in the background while you match the next set of pages. TuPACS can even be set to pop to the foreground automatically right after you scan a document. If you don’t have a worklist handy, then we’ve provided a free Public Modality Worklist to use with your tests.